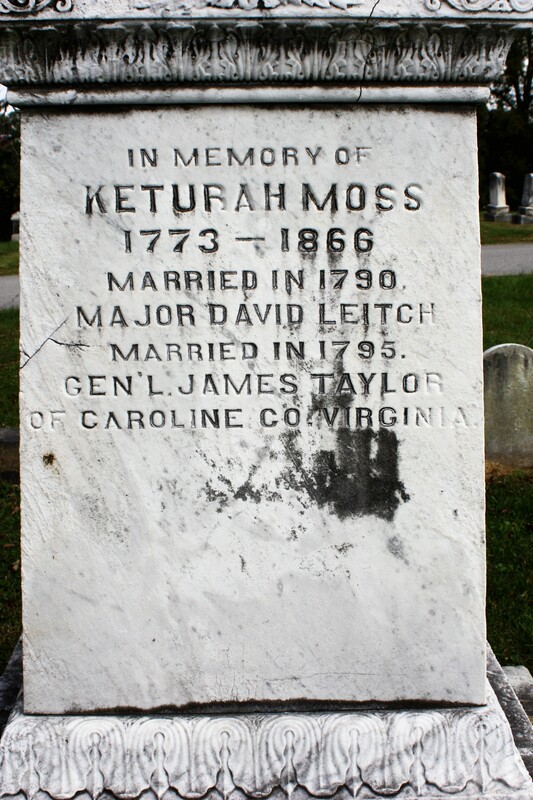 Keturah Moss was the daughter of Hugh Moss and Jane Ford. Her parents married June 1, 1768, in Goochland County, Virginia. Keturah was born September 11, 1773. When war broke out Hugh joined the revolutionary movement, became a captain and died from injuries suffered during the Battle of Brandywine in 1777. Keturah was only four years of age. Jane Ford Moss married John Vaiden, February 1, 1781, but he also died during the war. 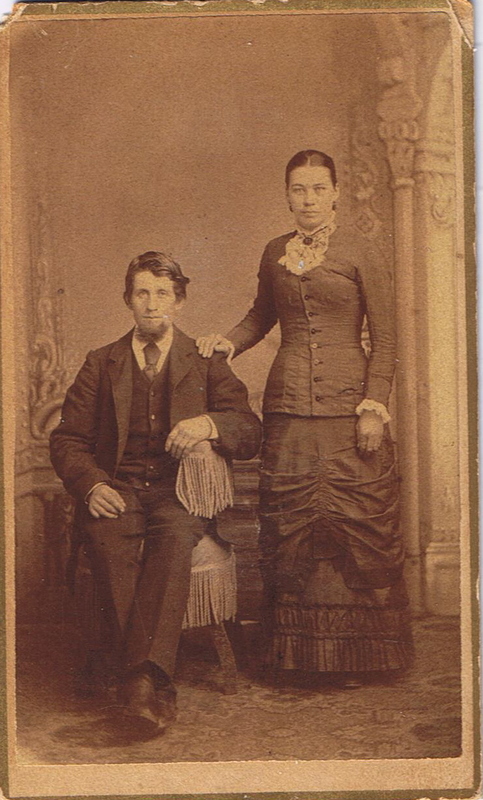 Jane’s next husband was Joseph Farrar. 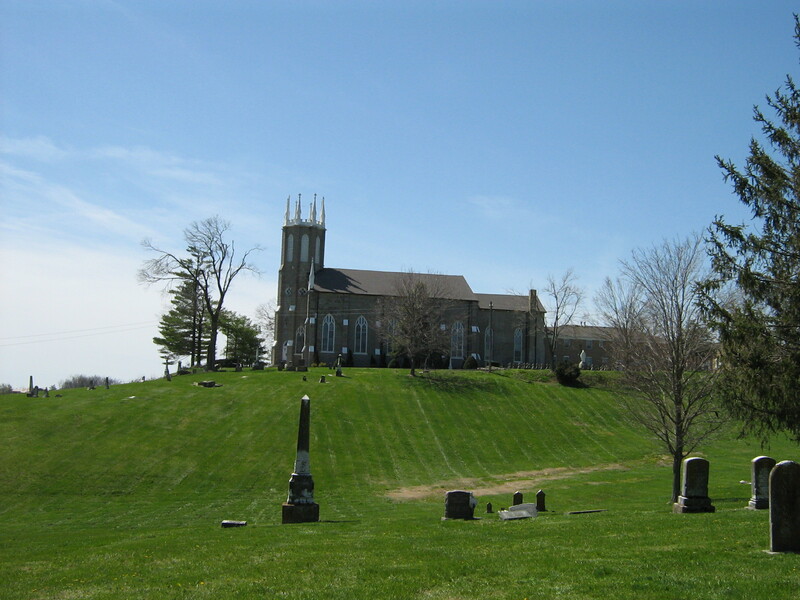 With two sisters, aged ten and fourteen years respectively, she was brought to Kentucky by an uncle, the Rev. 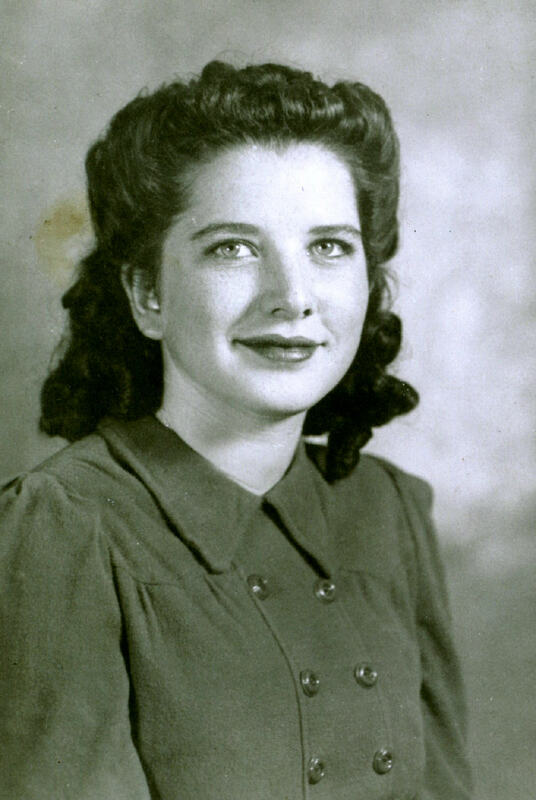 Augustine Eastin; her mother having previously married Captain Joseph Farrar. A party of forty immigrants on their way to Kentucky arrived at Mr. Eastin’s camp late in the evening, where they remained for the night. 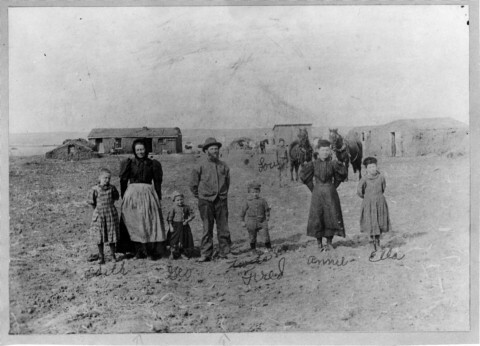 At daybreak the following morning a woman aroused the camp with the tidings that Indians had broken in upon a neighboring camp and were murdering the whites. 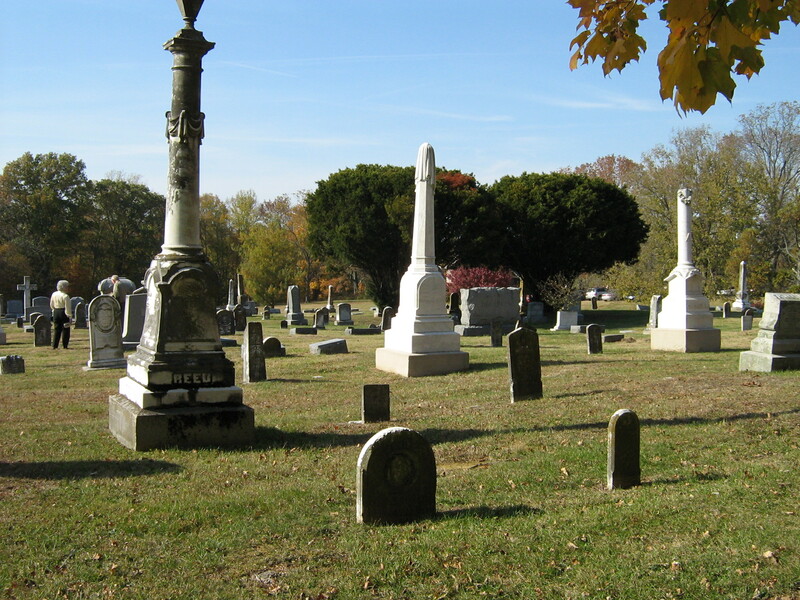 Mr. Eastin’s company hurried forward, and buried the dead bodies, the Indians having escaped. This dreadful spectacle was witnessed by the little girls, who frequently recited the horrible incidents attending the massacre. It seems impossible that a young girl of ten could be so brave. 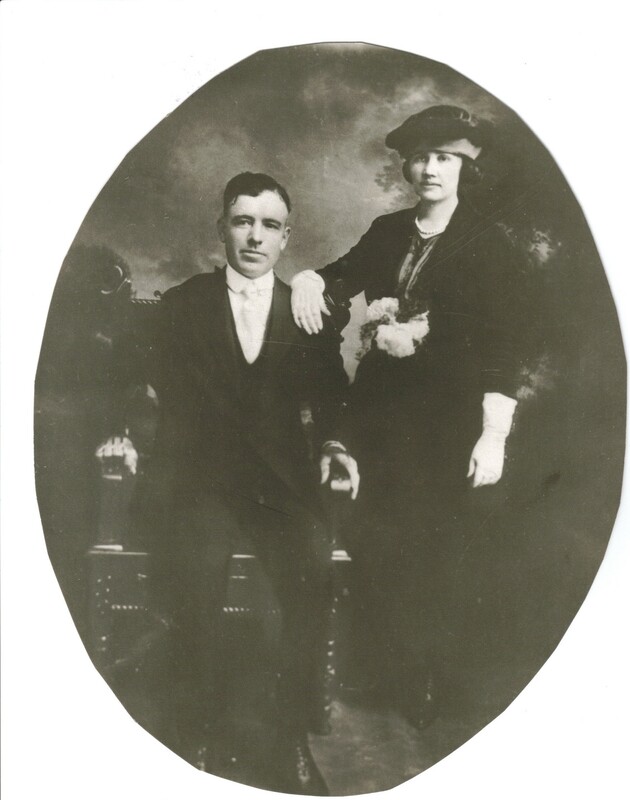 In 1790 she married David Leitch, a major during the war. He received 30,000 acres of land along Licking Creek for his service to our country and other land warrants and grants. This included thousands of acres in Jefferson County and over 14,000 acres in what is now Bullitt County. 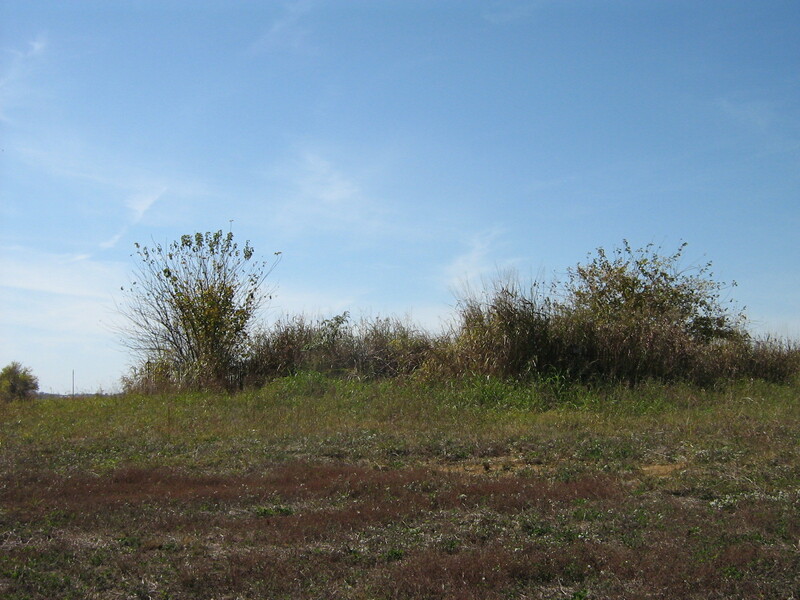 The area on Licking Creek was where he erected Leitch’s Station, fortifying the area with a block house to protect himself and other settlers against the Indians. 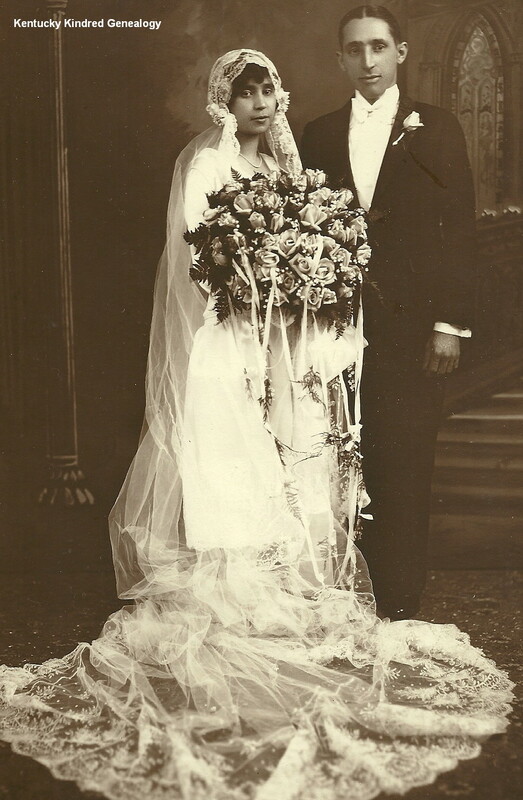 He brought Keturah there after their marriage. 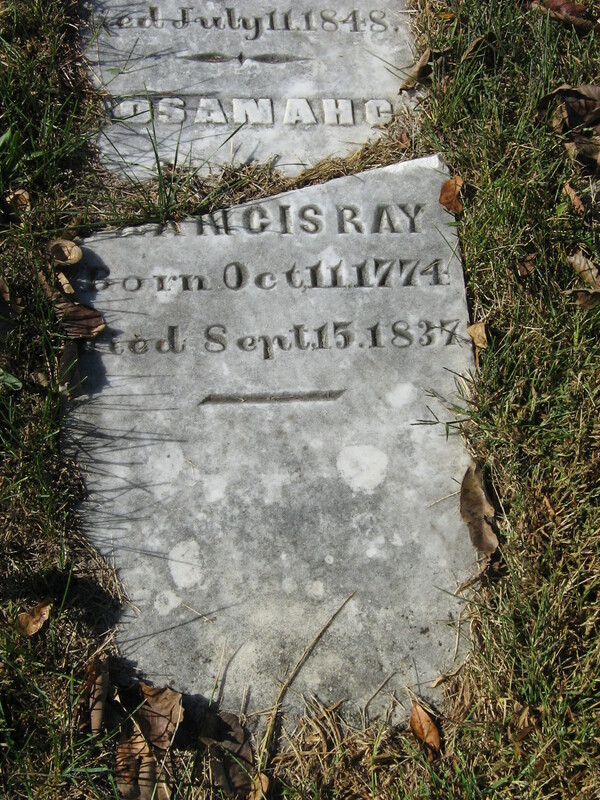 In November of 1794 David lay ill with pneumonia. He was badly wounded during the war, I’m not sure if this weakened his system. 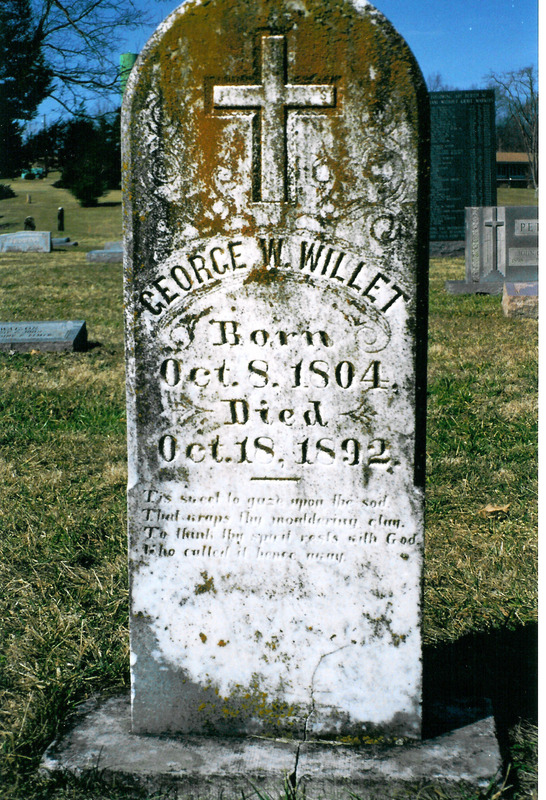 He wrote his will November 8, 1794, leaving everything to Keturah, and naming John Fowler of Lexington, Daniel Weisiger of Frankfort and James Taylor, executors, and Keturah executrix. Joseph Strong, David Nesbitt and George Gordon witnessed his signature. At the age of 21 Keturah was a widow. On November 15, 1795, she married General James Taylor, one of the executors of her first husband’s will. 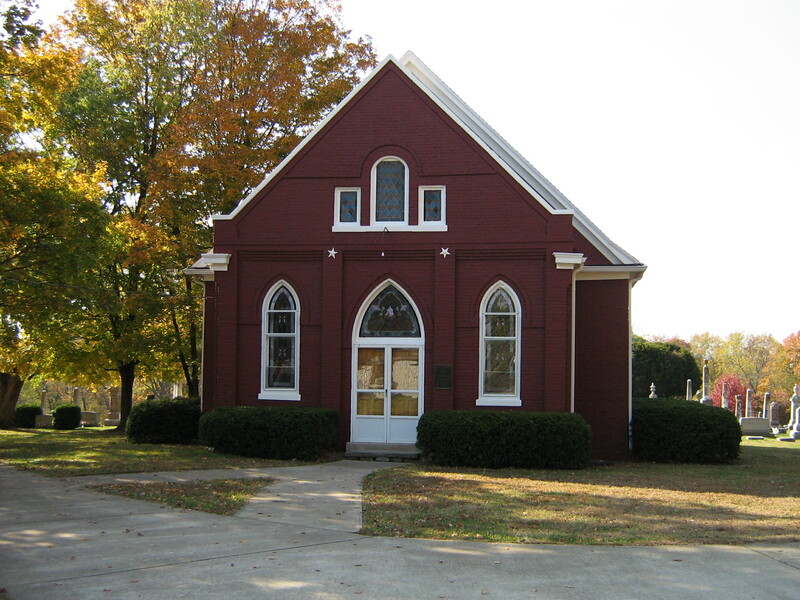 The wedding took place at her mother and step-father’s home, know as Tuckahoe, located in Fayette County, about five miles from Lexington. 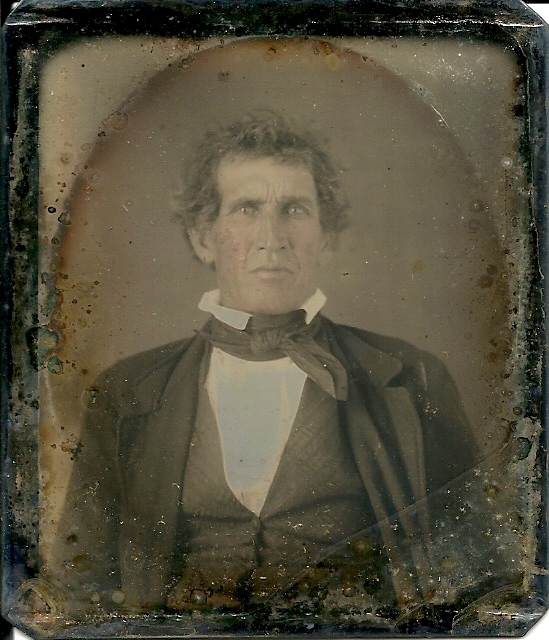 Keturah and James had eleven children, four who survived to adulthood – Keturah Leitch Taylor, 1802-1871; James Jones Taylor; Ann Wilkinson Taylor; and Jane Taylor. 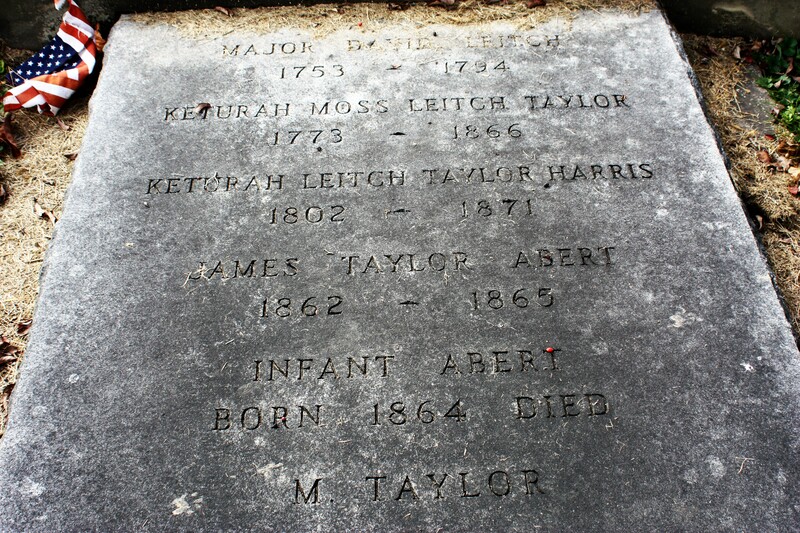 General James Taylor died November 7, 1848. 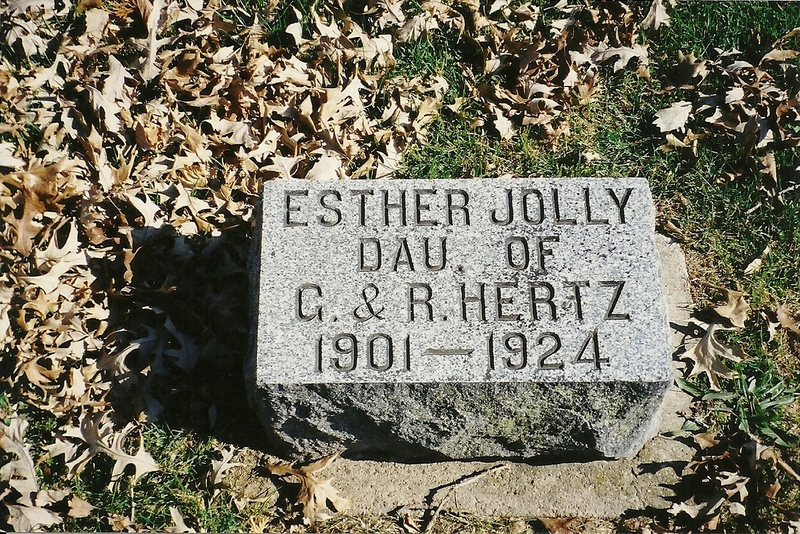 When her first husband died, David Leitch was buried in the yard of their home. 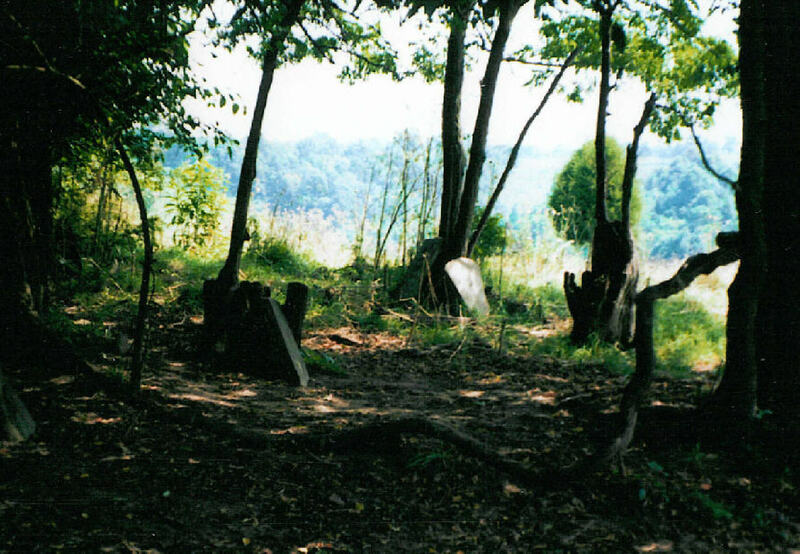 In 1853 she had his body moved to Evergreen Cemetery in Southgate, Kentucky, Campbell County. A beautiful monument was dedicated to him. And she decided to be buried with her first husband. In memory of Major David Leitch who was universally beloved for his benevolence, generosity and many virtues. 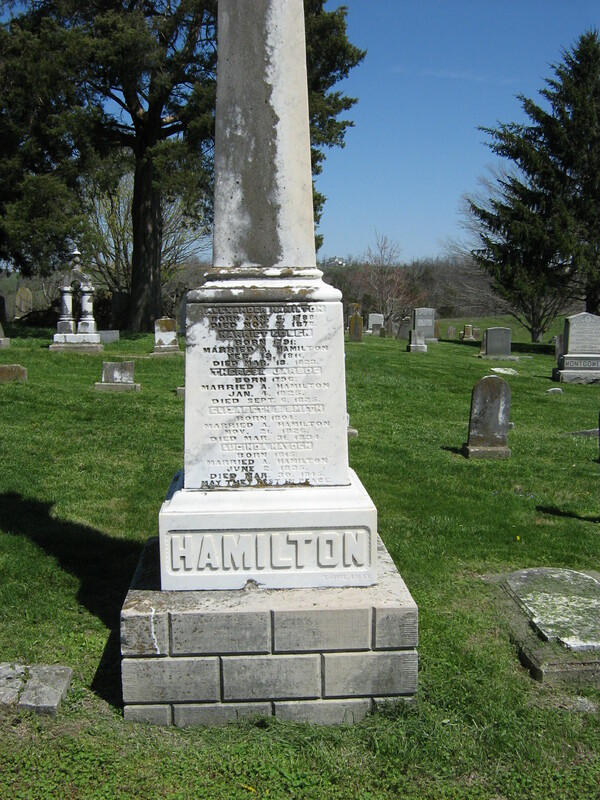 This monument erected by his devoted wife May 1853. 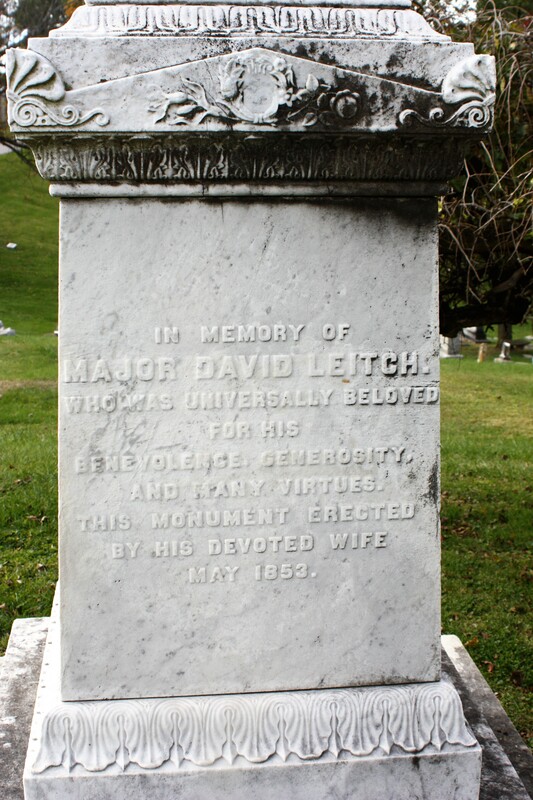 Sacred to the memory of Major David Leitch, who was born at Glascow in Scotland, September 11th, A.D. 1753. 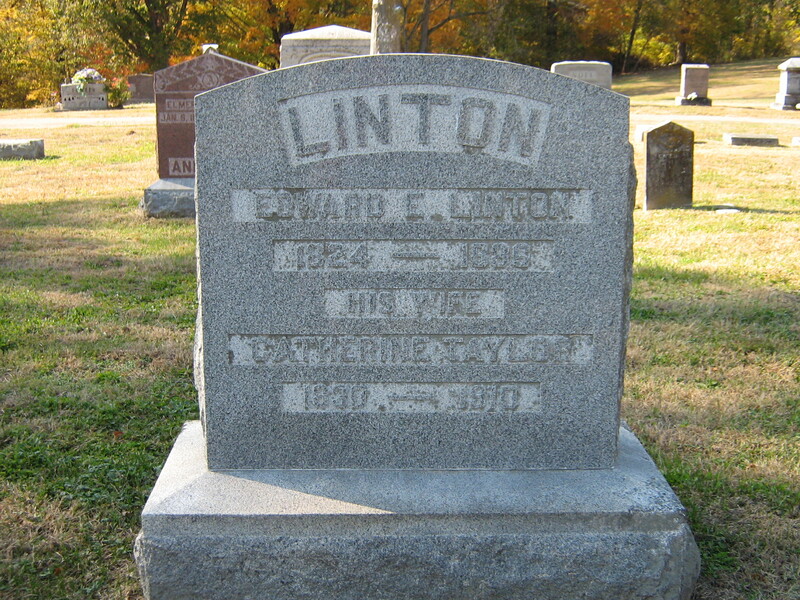 At an early age he emigrated to America with an elder brother and settled at Richmond, Virginia. A brave and patriotic republican. While quite young he took part in the struggle for American independence as Aid de Camp to General Lawson. 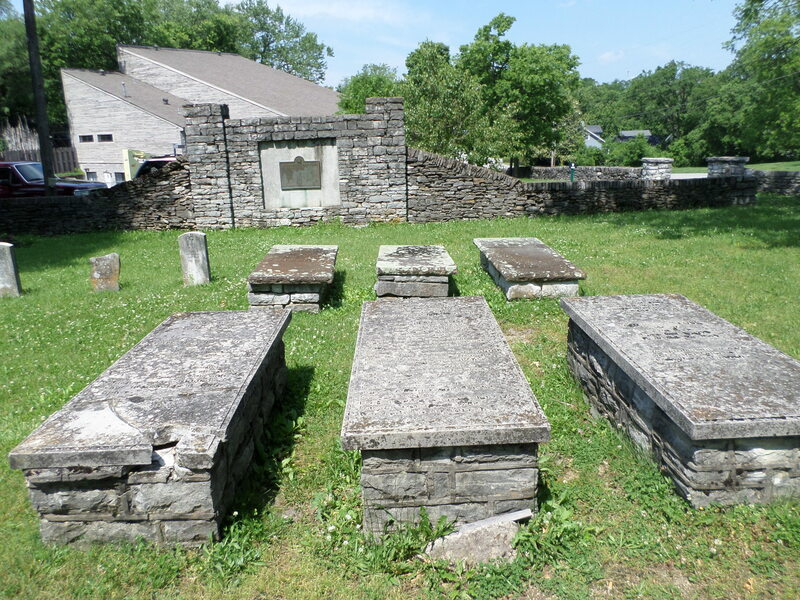 In the year 1785 he came to Kentucky and settled near Lexington. 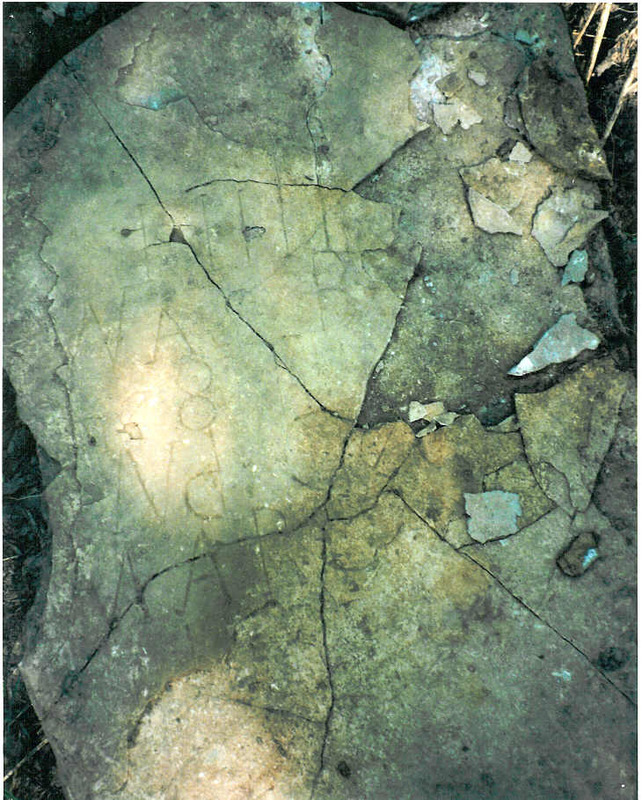 Subsequently he removed to his estate on the Licking River, near Newport, and there erected a block-house to protect himself and his associates against the Indians, at which place he died November 7, A.D. 1794. 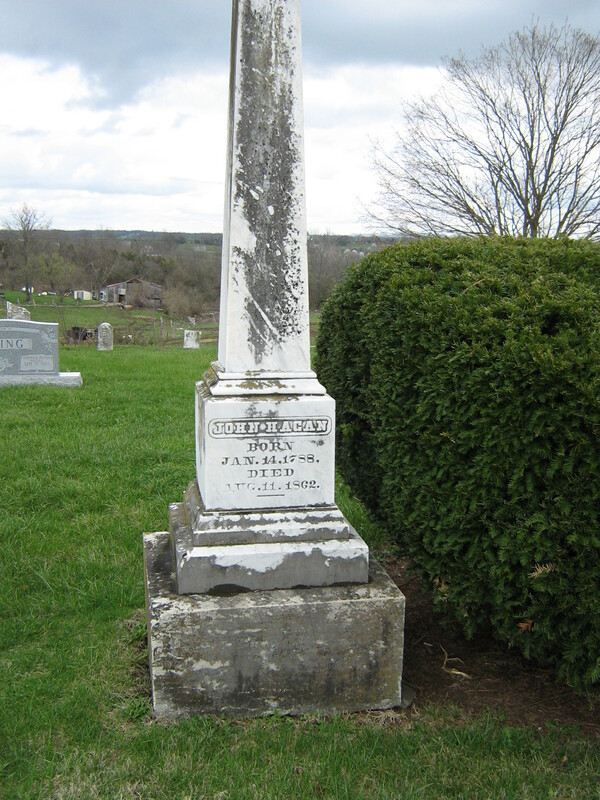 He was also a member of the first Convention of Kentucky. 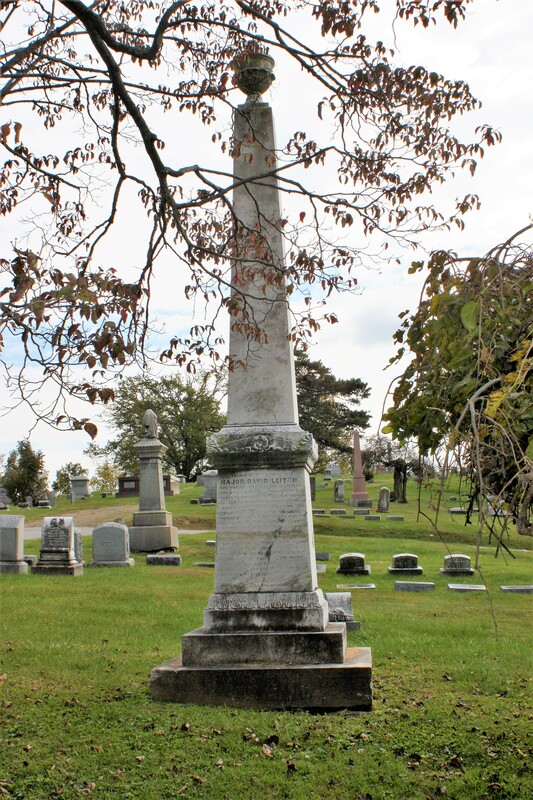 In memory of Keturah Moss, 1773-1866. 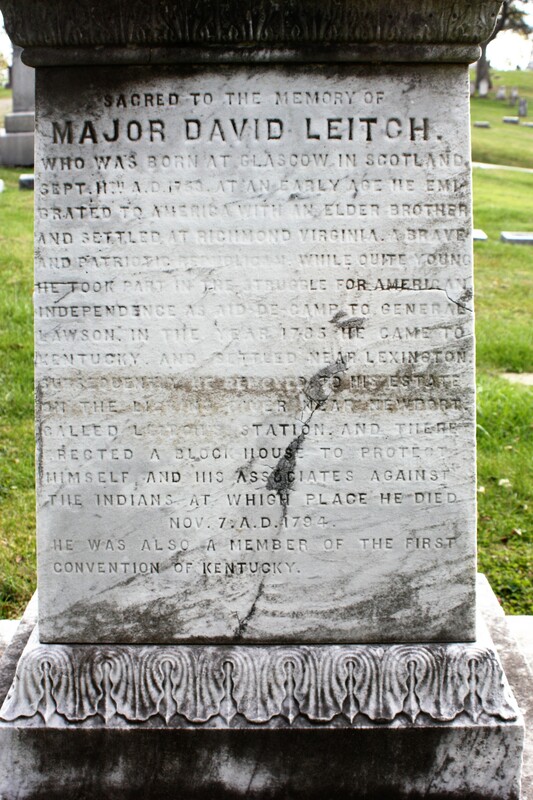 Married in 1790 Major David Leitch. 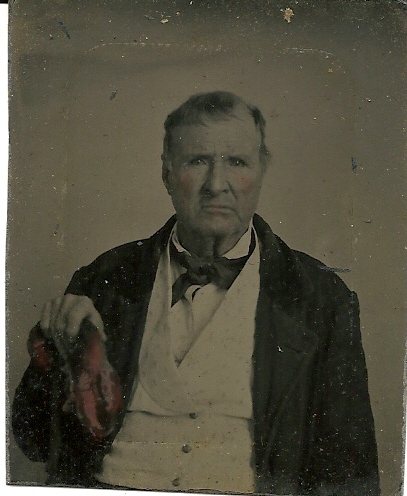 Married in 1795, General James Taylor of Caroline County, Virginia. 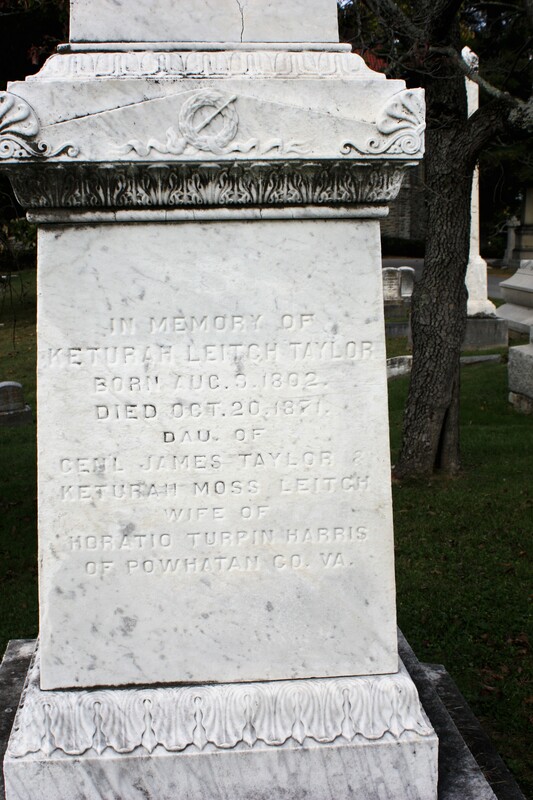 In memory of Keturah Leitch Taylor, born August 3, 1802, died October 20, 1871, daughter of General James Taylor and Keturah Moss Leitch, wife of Horatio Turpin Harris of Powhatan County, Virginia. Major David Leitch, 1753-1794. Keturah Moss Leitch Taylor, 1773-1866. 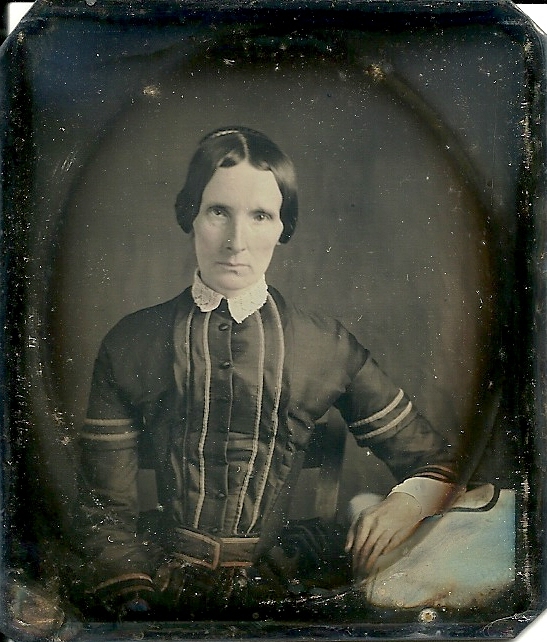 Keturah Leitch Taylor Harris, 1802-1871. 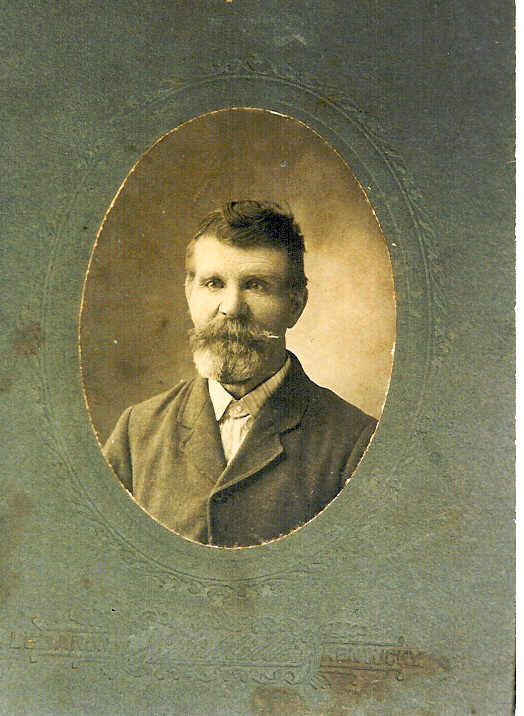 James Taylor Abert, 1862-1865. 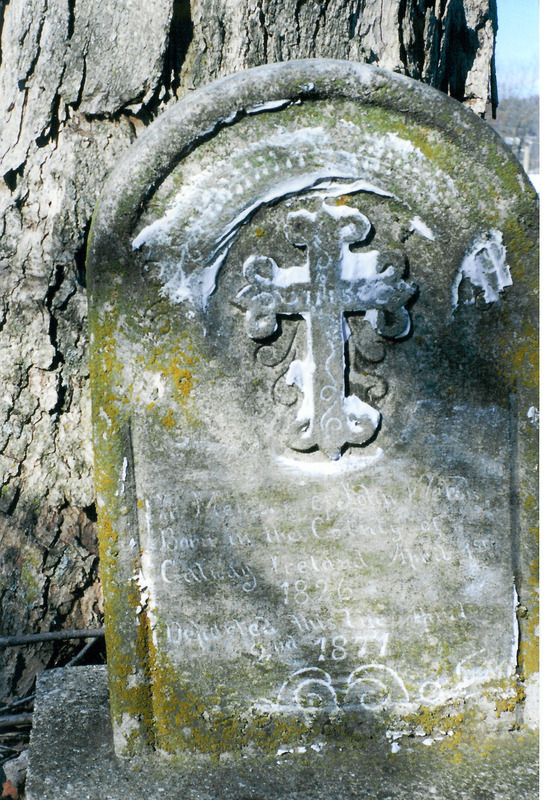 Infant Abert, born and died 1864. M. Taylor.